The day started with the last of the cupboard shelving getting a light sanding and final coat of varnish. Next the ceiling trim was lightly sanded with 240 grit paper before receiving the last coat of satin varnish. Just on dusk Jan and I removed the masking tape from around the ceiling trim. It took James almost two days to apply it but only 20 minutes to remove. We wanted it off before the tape hardened or stained the ceiling. 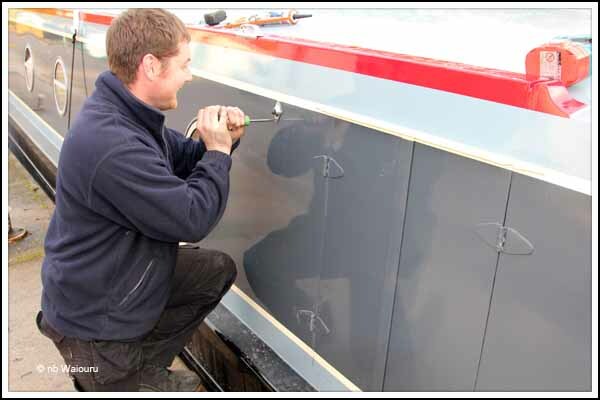 In the afternoon Nick fitted the rubber stops for the port side hatch exterior doors. I wasn’t sure where to locate the stops on the side of the cabin so I asked Nick to fit them. The starboard side will have to be completed after we wind (turn) Waiouru. 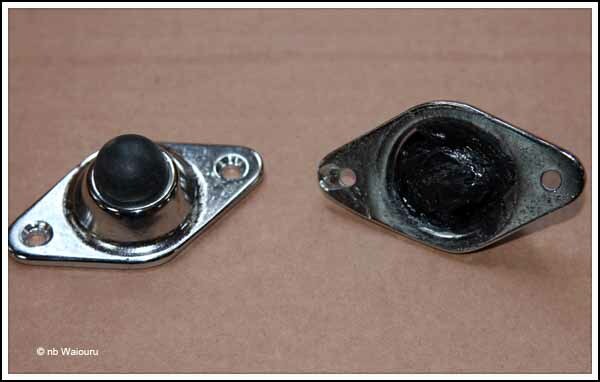 Paul from nb Apache suggested I fill the back of the chrome fitting with mastic as the rubber ‘stop’ can get dragged out of the fitting when passing an obstacle. It seemed very sound advice so I’s already done this to each fitting prior to Nick screwing them onto the cabin. 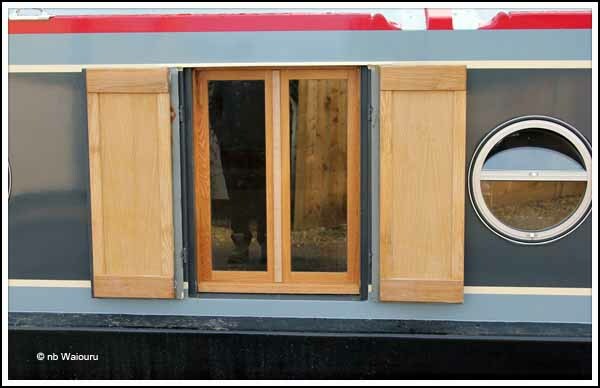 The exterior side hatch doors can now be opened without fear of damaging the paintwork. The open doors have attracted so much attention from casual towpath walkers Jan is thinking of selling tea and scones from the hatch It’s interesting how people wouldn’t dream of coming up to the window in your house and looking in but they are quite prepared to peer though boat portholes and hatches! We had visitors in the afternoon. Anne Borland and her friend Audrey called by to see us. We first became acquainted with Anne after we arrived in the UK and found ourselves in a serious dispute with our original boat builder. We were looking for some temporary accommodation and Anne very kindly offered us the use of her student house in Plymouth. It was a very generous offer and extracted us from a most difficult situation. Whilst the world has some “rotten people” they are a very small minority. The people who have helped us whilst we rebuild Waiouru demonstrate the great majority are kind and helpful.